The Annual ‘Party on Park‘ will be held on Sunday, September 20th, with Park Avenue closed to traffic from 118th to 125th Streets from Noon to 4pm. Last year the event hosted more than 2,000 people! 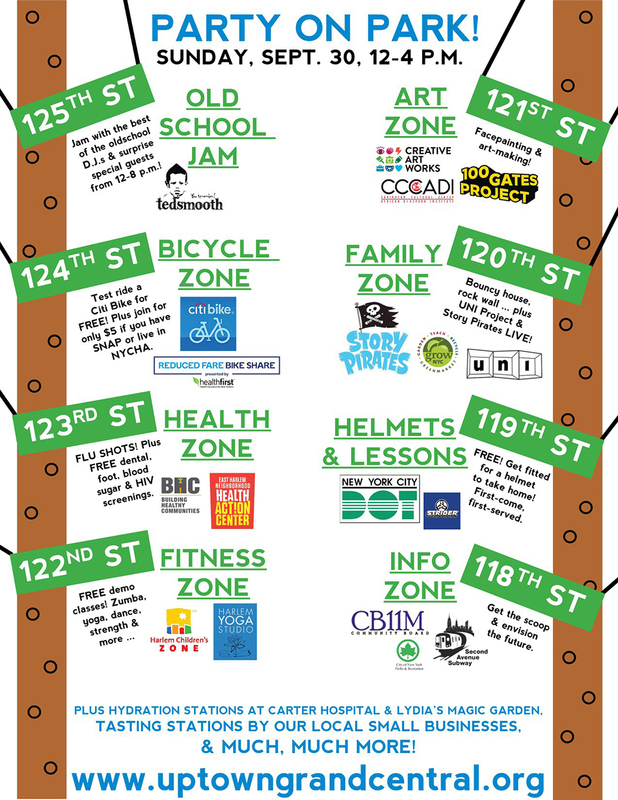 Organized by Uptown Grand Central, Party on Park a collaboration of small businesses and neighborhood partners surrounding East 125th Street who work to enrich the area through creative community projects. Since 2013, when we got our start as the New Harlem East Merchants Association, we have brightened hopes for the area via programs that include organizing our small businesses; hiring formerly homeless individuals to clean our streets; beautifying the commercial corridor with tree fences, flowers and holiday lights; sponsoring street festivals; and adopting the space underneath the Metro-North tracks at 125th & Park as a community plaza that features live music, exercise classes, a year-round farmers market and “pop-up” small business snack shop. Our goal is to strengthen and promote everything that makes our part of Uptown a “Grand” place to be, for all who live and work here.More at: www.uptowngrandcentral.org.